I often have multiple Intellij IDEA windows open simultaneously. What's annoying to me is that I often end up clicking the Window item in the top menu bar and them select the one I want from the a list like below. What I want to achieve is something as follows. After invoking the Alfred box (alt + space), when I type "i" (suppose I use it to trigger Intellij window search), alfred will list the open windows below the Alfred input box. And then, when I enter more characters in the input box, Alfred will filter the list by doing a fuzzy match. 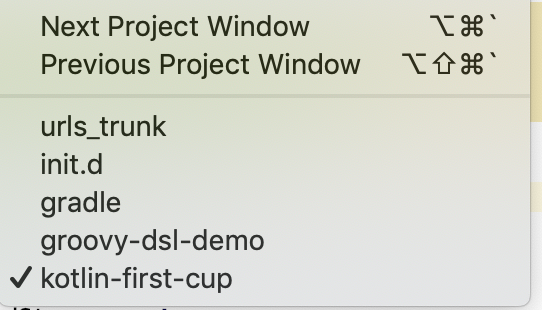 For example, when type "i urls", Alfred will only show the "urls_trunk" project, and when I hit "Enter", it will bring the focus to the corresponding Intellij window. FYI, I am 100% newbie to Alfred and I have only used it for a few days. Thanks. Not sure if it’ll work for that, but try the Menu Search Workflow or using a shortcut for the Help Menu.